The CTLLED2 LED Track Head is available in 18W, 27W and 42W LED. LED technology offers an unprecedented lamp life. This fixture is virtually maintenance-free. Engineered for illumination of retail displays or any area where high efficiency and color rendering are desired. Available with four different track adaptors to fit most existing line voltage systems. Also available with stand-alone, mono-point mounting canopy. 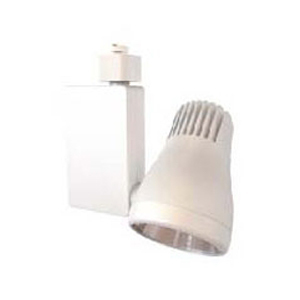 A 42W LED is comparable to a 70W metal halide (depending on color temperature). 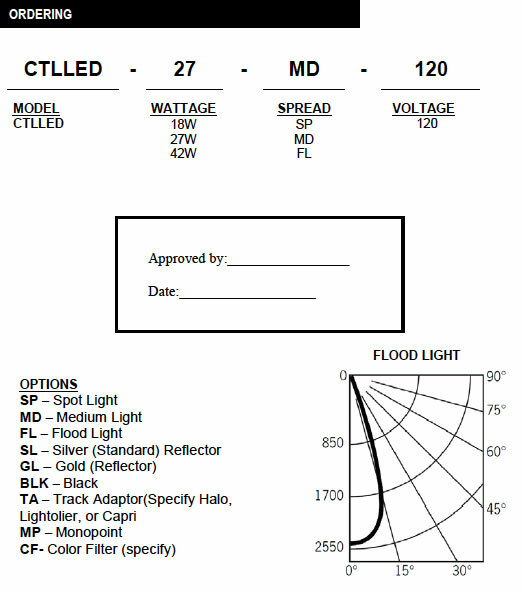 A 27W LED is comparable to 100W incandescent). Dimming option down to 1% available. Heavy aluminum alloy housing provides durability and maximum heat sinking for longer life of electronic components. Available in 3 beam patterns: Spot, Medium, or Flood. Tempered glass lens is standard. Consult RLE for optional colored lenses and lens patterns. Exterior housing is finished in white as standard.